Microsoft Office 2008 for Mac is the best option for Mac users who share documents at home, work, or at school. Microsoft Office 2008 for Mac comes packed with powerful features for creating artful documents, dynamic spreadsheets, and effective presentations. Plus it's completely compatible. No need to worry if your documents will open correctly on PCs or other computers. It is is the most powerful productivity suite available for the Mac users. ...... to less power even if it means paying more to have the tools they need, when they need them. 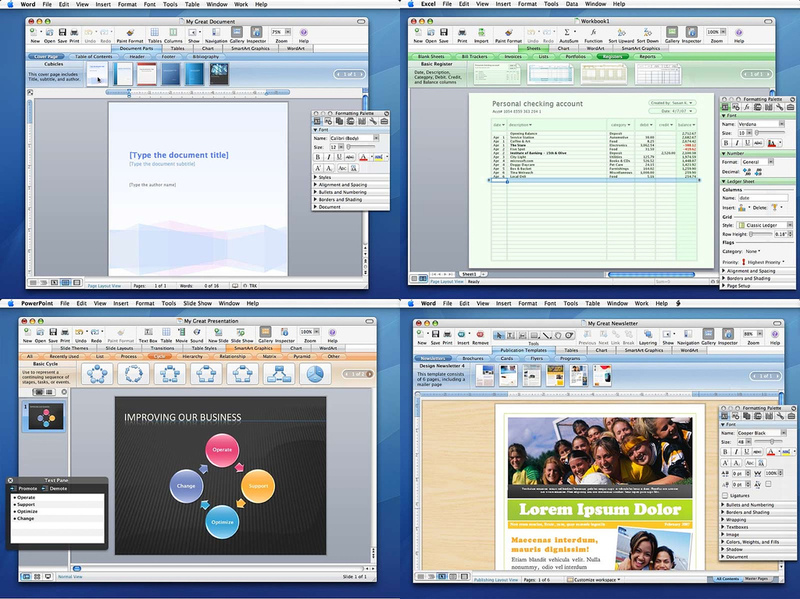 Microsoft Office 2008 for Mac is the most powerful productivity suite available for the Mac. It delivers everything for both basic and power users features such as pivot tables in Excel, or advanced mail merge in Word in one comprehensive package. No one likes being caught off guard, especially when the pressure's on. That's why it's vital that shared documents, presentations, and spreadsheets open as they were designed regardless of the computer or operating system. Microsoft Office 2008 for Mac is the smart choice for people who share Office files at work, school, or anywhere else. Research shows that 75% of Mac users use a PC at least once a week. And almost every Mac user exchanges documents with PC users. With Office 2008 for Mac, you can feel confident in your compatibility. Qweas is providing links to Microsoft Office 2008 for Mac 12.3.1 as a courtesy, and makes no representations regarding Microsoft Office 2008 for Mac or any other applications or any information related thereto. Any questions, complaints or claims regarding this application Microsoft Office 2008 for Mac 12.3.1 must be directed to the appropriate software vendor. You may click the publisher link of Microsoft Office 2008 for Mac on the top of this page to get more details about the vendor.